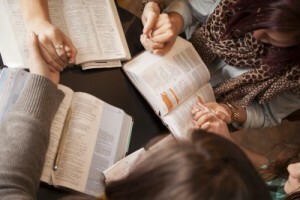 Making my way to a Bible study group I wondered, “Am I here to study the Bible or am I just trying to get out of the house?” I’d always been familiar with the Bible, but this study would challenge me to dig deeper in knowledge and application. Tragedy struck our family a month later. I immediately went from a casual Bible study reader to consuming it every day for my spiritual and mental survival. Does something bad have to happen for believers to commit to regular Bible study time? Not at all. Most of us struggle with the desire and follow through in Bible study compared to our desire for other things. Until you decide that Bible study is a necessity for your life—you may never make time for it. Make an affirmation of commitment to reading the Bible to yourself, to your spouse, to your children, and to your friends that it will be a priority. “In the same way, the Spirit helps us in our weakness” (Romans 8:26). Admit your lack of enthusiasm or procrastination regarding the Bible. The Holy Spirit will stir up a desire in you to want more of God through the reading of the Bible. By sticking to a 21-day plan, you will develop a habit of reading the Bible for a lifetime. Try starting in the Psalms, Proverbs, or even the gospel of John. Eventually your day will never seem right if you hadn’t spent study time in the Bible first. “You taught me wisdom in that secret place” (Psalms 51:6). Your sacred place for Bible study could be in your kitchen, office, bedroom, or any place where you will not be easily distracted and will stay on track. Keep your Bible, journals, or other helpful study resources close by for easy access. “Give careful thought to the paths for your feet and be steadfast in all your ways” (Proverbs 4:26). There will always be other good things to accomplish during your Bible time. However you must take the initiative beforehand, block out your schedule, and stick to it. Be part of a small group for accountability. With a small group you will have discussions for sharing testimonies, observations, interpretation, and applications of Bible study. Having a place to go and people to meet will keep you from making excuses to put off studying the Bible. “Be careful that you do not forget the Lord your God, failing to observe his commands, his laws and his decrees” (Deuteronomy 8:11). Having daily reminders helps the busiest of people to stay on the course of serious Bible study. Once your study time becomes a habit, you will need fewer reminders. “Be careful to obey all these regulations I am giving you, so that it may always go well with you and your children after you, because you will be doing what is good and right in the eyes of the Lord your God” (Deuteronomy 12:28). Family time is more productive if there is opportunity for the reading and sharing of Bible scriptures. It doesn’t have to be a long, intense study but rather just daily dose of God’s word. “He guides the humble in what is right and teaches them his way” (Psalms 25:9). A prideful heart resists the commitment of studying the Bible everyday. Having a heart of humility opens the opportunity for revelation of God’s word in ways you may never fully understand. “Man shall not live on bread alone, but on every word that comes from the mouth of God” (Matthew 4:4). Sometimes we get confused thinking that food for our physical bodies is more important than the food of God’s word for our spiritual bodies. Of course we would die without physical food, but a spiritual death is far more devastating and has consequences throughout eternity. For the determined mind and committed spirit—finding time for Bible study isn’t all that difficult. We must guard against the busyness of our culture that crowd out intense devotion to the Scriptures. Don’t you want to know God’s thoughts on your life? Everything you need is right there on your nightstand, your phone, or iPad. Pick it up and learn to hear your Father’s voice today. Thank you for the tips. God bless you and keep you. VERY helpful tips on reading God’s Word, the Bible! Belong to an on-line Bible Study site on computer, have earnestly studied and prayed daily now for over a year. Yes, sadly, there are days it seems like a “chore.” Awful, huh? Yet, plunging on, I do find my spirit (and interest) uplifted! Going to try Tip #3. Not to blow my own horn (’cause it’s Jesus’ Holy Spirit that gets ALL the credit…) but I recognized EVERY Scripture passages you had in your article! I “patted myself on the back” for being a good student. LOL! Being hearing-impaired (need to lip-read & don’t know ASL, never “needed” it) I’m unable to enjoy participating with a group. My hubby, Gary, and I recently joined a Bible Study at our Church, studying the Book of Revelation. By the 3rd. session, I was so frustrated not being able to lip-read the others in group, even our Pastor. Boo-hooed like a big baby once home. All those rotten feelings I had re:hearing loss while growing up just overwhelmed me, Crystal! (Feeling like a freak, that I didn’t belong, etc.) Gary was such a dear comforting me, reminding me those feelings were false. I prayed to Jesus, after a peaceful sleep, woke up feeling quite fine and dandy, God’s love just pouring through me! So, Gary & I decided that he would go to Bible Study alone, then instruct me at home afterwards. Oodles of blessings for you, Crystal, and your wonderful family! Praying for you Pat…stay strong in the Lord. What a wonderful desire it is to lead others in Bible study! I’ve led many Bible studies and it’s always started with a desire in my heart to share truths with other women. You could start with a small group of people…maybe just 2 or 3. Begin with a book of the Bible (like John or James) or there are a tremendous number of wonderful group studies out on the internet to choose from. The Lord will lead you in the right direction when you ask Him. God’s blessings on your wonderful endeavor! Hey Chrystal, this is some real great information that you gave here. Bible reading is really important to our spiritual growth. Let me share 2 of the ways I make time for God. 1. During your lunch break at work, you can divide it in two. 1/2 for lunch and the other 1/2 for bible reading and study. Those are wonderful suggestions! I really like the vacation idea…it’s those sweet times of communion with the Spirit of God that give me the courage and strength to move forward. God bless! Dear Tshepiso, it’s difficult to point you in one way because there are so many ways to grow in God’s word. Of course, Psalms and Proverbs are a wonderful start. Have you memorized whole passages yet? It’s a wonderful step of spiritual growth to know chapters by heart. The book of John is an excellent start as well. You could have a notebook nearby to write everything you learn about Jesus. Also you can study passages that are preached in your church for a deeper study. I hope this helps you…are you in a Bible study? Studying with others also helps you grow deeper in the word. God bless you on this wonderful endeavor of searching for His truth…He won’t let you down! Hi Patricia! What a blessing to hear of your passion and hunger for His word. May you be blessed beyond measure. A truly terrific article with Scriptures, Sis!! Can’t begin to explain, Crystal, how Jesus’ Holy Spirit has magnificently changed my daily Bible-reading & studying! Had to share this joy with you, Crystal! God’s wonderful blessings & graces continue to shower upon you, Crystal, and your family!! Thanks for this great article. It had some simple and to the point tips that I hope to use to read my bible more often. I think the best way to make sure you read the Bible every day is to set up a specific time to read. For example, I do my reading right before I go to bed. So, the time is not the same every night, but I do read the Bible every night. It is one of those things that is now a habit. I can’t go to sleep until I have done my reading. Next post: What Is Christian Medi-Share? Is it Biblical?